Browse > Home / Headlines, Life, Science, Weather / Puget Sound Weather Geek: Will Summer ever come back? Puget Sound Weather Geek: Will Summer ever come back? Press “Play” button to view/hear the live, local weather stream. Well it doesn’t really look like July out there anymore, and considering the trend of our summer so far (sunny day – cloudy day – sunny day – cloudy day) you’re probably wondering how long this is going to last. Well, as is the case with a lot of weather forecasting – it’s unclear. This bout of cloudy/showeryness is due to an upper level low (ULL) off-shore. This is a spinning blob of cooler air and moisture in the upper levels of the atmosphere. 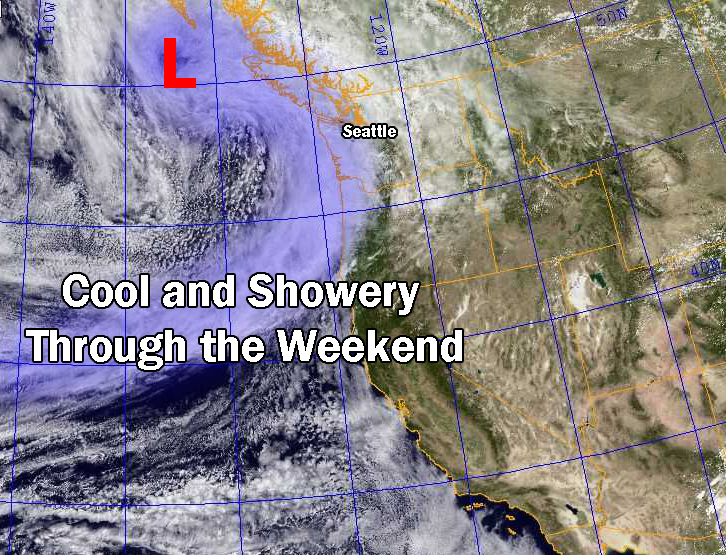 This particular system will swing through the region this weekend bringing cooler and showery weather. A few thunderstorms may be in the mix for Saturday as well. Afterwards though, the models and forecasters aren’t sure whether a warm spell will form, or whether another one of these ULL’s will bring us back into cloudy/rainy land. The forecasts are calling for a chance of rain each day until the middle of next week. Thanks for visiting! If you have any comments, suggestions, or feedback please email me at [email protected].